I had an hour to spare before picking up up the kids at the end of the drive, so I took the opportunity to wander around the south-east corner of the farm. The ponds are looking good. I was curious if there was any forage left on the ground. In a few places there’s some food, but a lot of the pasture has been eaten way down. Still, there were some richer places. 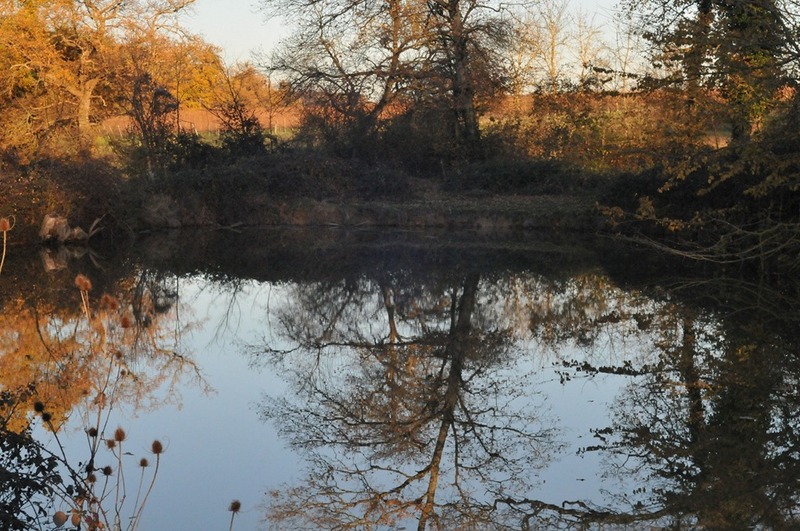 This is one of the larger ponds. It is full year-round and sits at the border of the property. When I bid for the farm this year our neighbors bid for the pond. The SAFER preferred to keep the farm intact so it stayed with me. 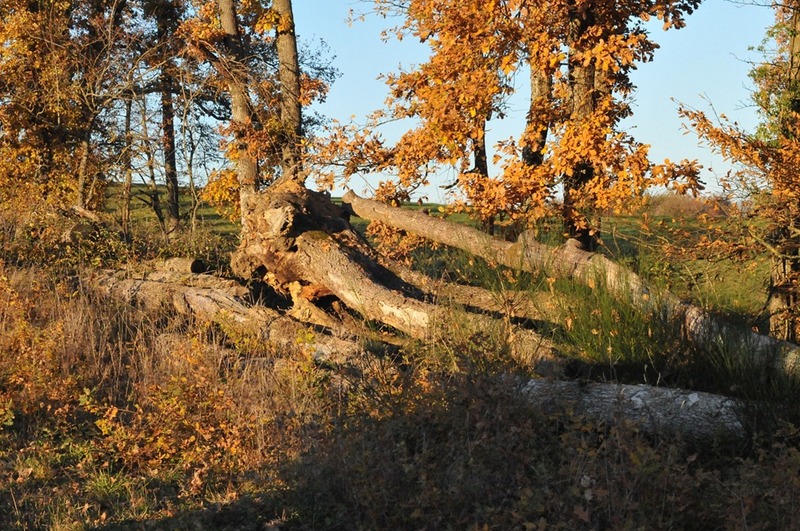 There are still a few fallen trees around the farm from that big 2009 windstorm. Bringing them in is a project for the future. The lucerne/alfalfa field at that corner of the farm has a lot of thin grass growing underneath. It looks green but I doubt there’s much food value there. And despite our recent dry weather, I found this a few wet patches like this one. It’s a spring near the top of the pasture. It feeds water into the lakes. The sun was almost setting and it made clear the patterns in the hillside. There were several of these light trenches running down the pasture paddock. That water from the springs flows slowly down these trenches. This gives me a couple of thoughts. Firstly, how old is this system? 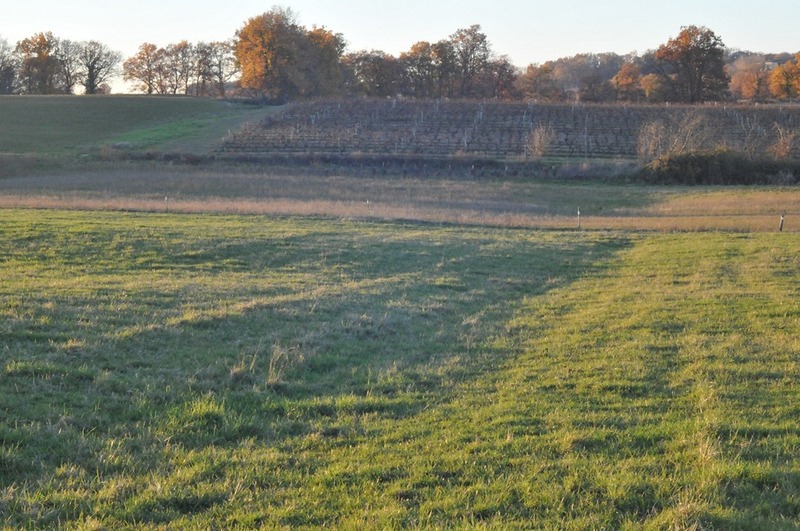 Were there older field boundaries and structures to conserve the water? The parcel structure of the land is very complex, much more intricate than the modern paddock boundaries. My second thought is whether we can better utilize this water source. Given its wetness, I’d like to use this paddock for summer grazing when the Gers gets very dry. Maybe some obstacles to the water flow would help spread the water around the neighboring soil like Peter Andrews does in Australia. There’s plenty of worm evidence in the pasture. Michael, the sitcom neighbor, calls this wormsign. 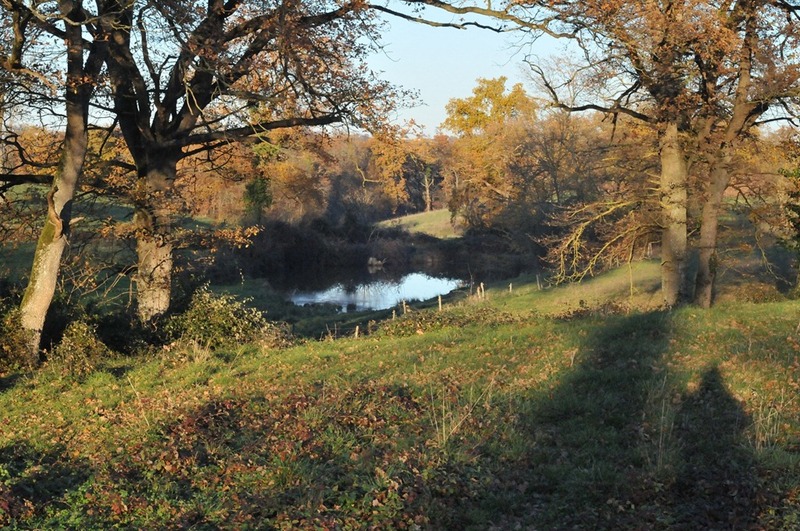 All the rain that falls on the farm flows down into the two main little valleys within the farm borders. Both have lakes at the downhill end to capture the water before it leaves. I like walking the farm. I’m postponing the arrival of animals until the spring when I know there’ll be plenty of forage, but I still like watching the changes as the weather gets colder. It gives me more knowledge before we face the first winter with animals at the end of 2011. Hi Brat. These are very beautiful sights of Your farm there. Just a few questions popping out… Have You done some soil tests already? Is there plenty of volunteered legumes growing? The thin grass in the alfalfa field usually is a sign of lacking phosphorus. 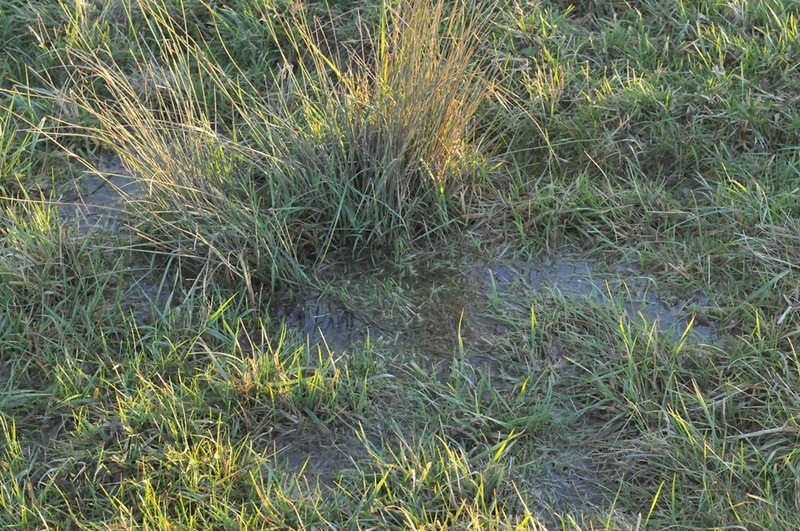 At the “worm evidence” picture – if it’s not taken on some kind of road (or track), that picture means your pasture is heavily tramped (I think it’s called “hard pan” in US). The grass (not the small clover) on that picture is “quack grass” – very persistent weed, small feeding value. At the second picture it looks like You’ve got some fescue there. Here in Europe the fescue is not the “toxic” kind, You could introduce it on the pastures and hayfields without any doubts. How exciting it must be to get to know a new piece of land! The ‘bc’ stands for Brent Curtis. The Brat is Jean, my wife, and her site is the http://bratlikeme.com one. The thin grass in the luzerne field is the wild stuff that has blown in after the field was (I’m guessing here) disked and seeded a couple of years ago. The pastures have much thicker grass, but it has been eaten down in fall with continuous grazing. 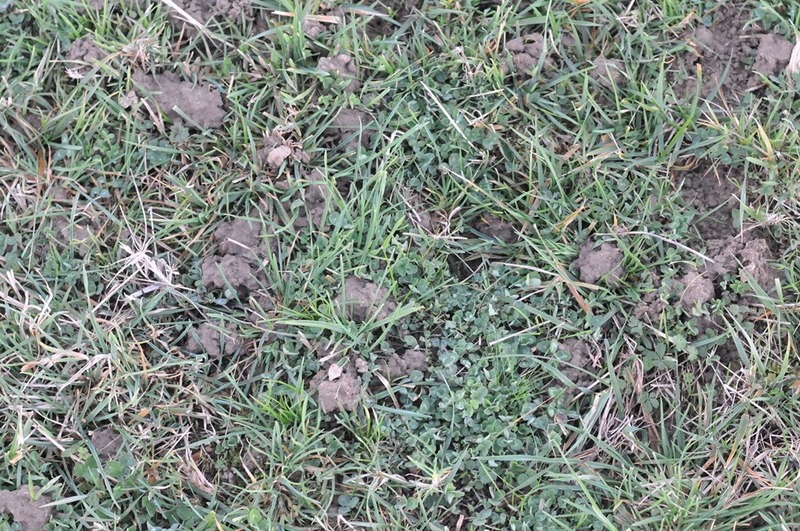 The second photo shows about the thickest stuff on the farm, although I have a lot of fescue like that around the house. I do need to do some soil tests – there’s a lab not far away. Thanks for the reminder. That worm photo is not typical. I’ll do some digging to see the state underneath. I was happy to see worms, since they have a hard time around vineyards where they spray a lot of chemicals that kill worms (I think copper sulfate is supposed to be the bad one). 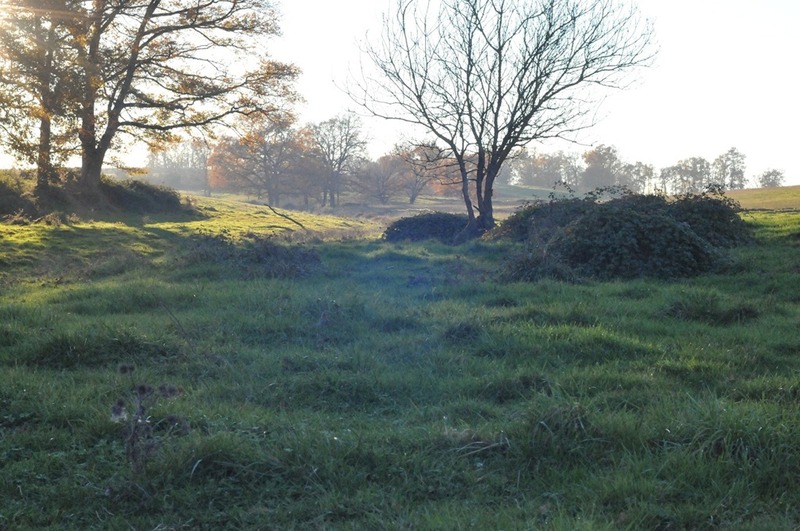 The locals tend to seed pasture with (French transcriptions here) Fétuque, Dactyle and Ray-grass, in American that’s Fescue, Orchard grass and Rye grass. My rough plan was to sow some mixture of the above in the hay fields. 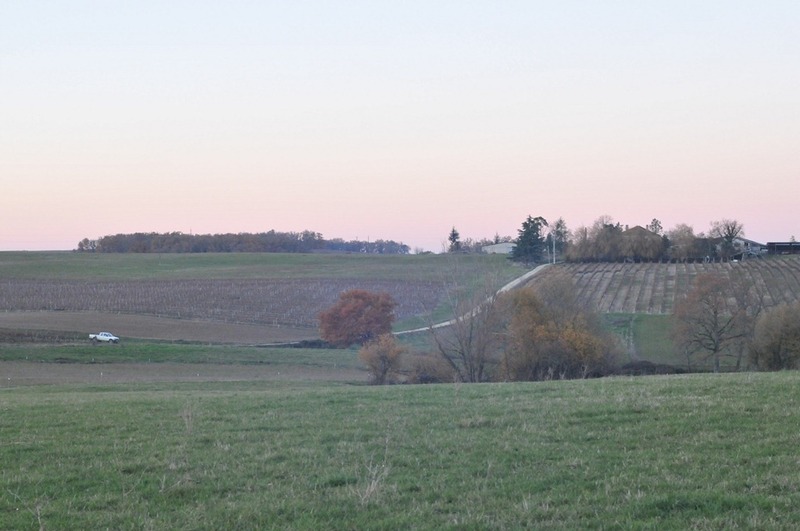 But what to do with the old vineyards, corn fields and sorghum fields? I’ll think this one through. In general the farm has been run down for about 20 years but was heavily used by short term renters in the last 12 months. I’m not going to run it at any great cattle load for a few years so there should be plenty of spare pasture to experiment to see what works. @Kevin, yes it is very exciting. It is scary, too, since you feel the history from the previous owners plus the eyes of the neighbors watching you. With the buildings I just laugh at the hacked together nature of the work. In general I don’t think many farmers pay close attention to their pasture. I’ve seen a lot of awful pasture, they just rely on getting a barnload of hay in May and June. Quack is sign of hard pan, but is also considered one of the dynamic plants in Biodynamics. 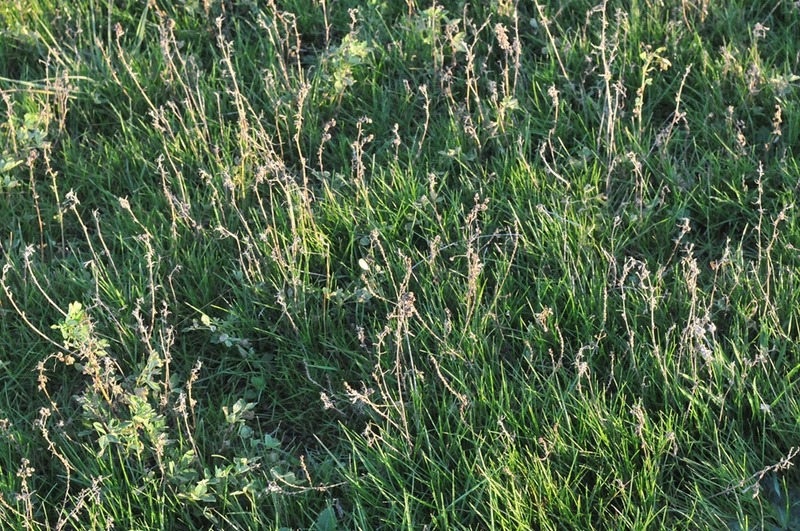 Do you have access to a pasture mix blend for seeds? Common here is mix of grasses and clovers, although I think once you start putting cattle on the land in a reserved way you will see improvements.